Welcome to our next Saturn Week curator – Sierra Ferguson (@SaturnSierra)! 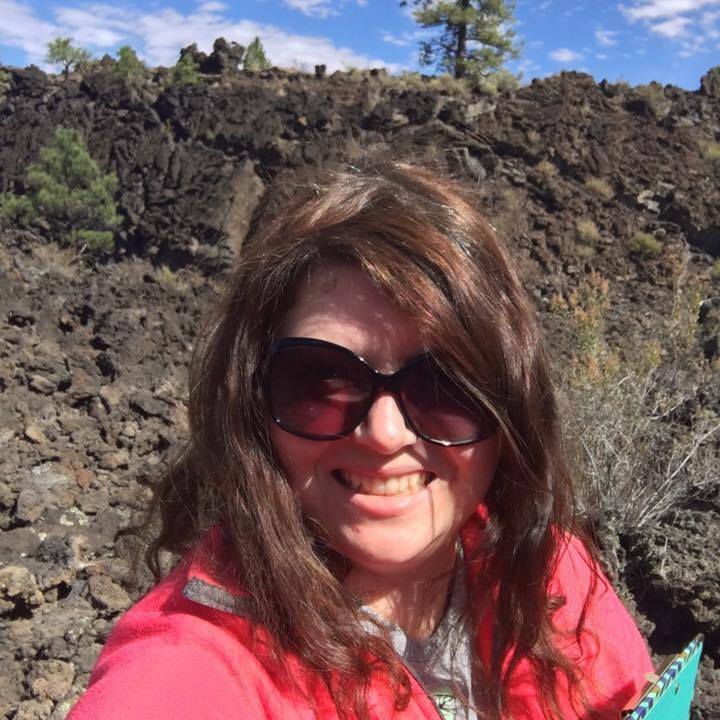 Sierra is currently a PhD student in the School of Earth and Space Exploration at Arizona State University and earned her B.S. in Physics and Astronomy from Northern Arizona University. Her interests lie in planetary imaging, geophysics, impact cratering, and mission development. She hopes to be involved with future missions to explore the Outer Planets. Here’s how Sierra ended up in science. I had always enjoyed science as a kid, especially geology and astronomy. Growing up I was that kid who had a rock collection and had to know everything about her rocks. I found astronomy through the characters and stories on Star Trek Voyager. Watching Star Trek and seeing images from spacecraft like Cassini grabbed my interest in the solar system and space sciences in general. In 8th grade we had to do a career in science project and I picked the career of Astronomer. I found out that I would need a PhD in physics or astronomy to even be considered for any astronomer job. When I saw the math courses that I would need to take, I thought “There’s absolutely no way I can be an astronomer if these are the types of classes you have to take!”, so I decided that I wanted to become a historian. A (passionate) physics teacher I had my senior year made all the difference for me and helped change the course of my life from being a historian to a scientist. Learning physics for the first time I felt like a whole new world had been opened to me and that there was so much to explore. When I attended my undergraduate orientation, I told the counselor that I wanted to double major in history and the merged Physics and Astronomy program. The counselor looked shocked and said that I wouldn’t be able to do everything and expect to graduate in 4 years, so I made the choice then to stay just in Physics and Astronomy and take history classes when I could. I sort of stumbled upon Planetary Science as a freshman in my undergrad program. When I began, I had absolutely no idea what I wanted to do with a degree in physics and astronomy, but I knew I wanted to study subjects in Physics and Astronomy. Luckily, my department hosted a weekly seminar for undergraduates where each faculty members in our department told us about their research and how we could get involved. One faculty member spoke about Martian impact craters and why cratering is such an important process to understand in planetary science. After hearing her talk, I was hooked on planetary and I wanted to learn more. Two years later I started a NASA Space Grant internship with that same faculty member looking for central pit craters on Saturn’s moons of Rhea, Dione, and Tethys. That project got me started researching the outer planets and I haven’t looked back since. What keeps me here in the field is the spirit of curiosity and drive to explore our solar system. There’s still so much we don’t know about our outer planets and their moons, which makes them great places to go and further explore. I’m working on mapping the impact crater distributions on Saturn’s moon Tethys and figuring out what they can tell us about the type of impactors that hit the moon. I take raw data from Cassini and process it through standard USGS routines. If there are multiple observations that would form a nice mosaic (collection of images all tied together). I go into the images and count the craters, but I sort them based on morphology (polygonal, elliptical, circular, etc). I’m hoping to also get involved with some geophysical modeling of the Saturnian moons. The cratering work that I’m finishing up now will add more data to our understanding of cratering on Tethys which is exciting! Our study areas differ from previously published work, so we are getting entirely new crater counts. Impact craters can reveal what kind of material is located underneath the existing surface of a planetary object, so they allow us to probe the depths of the world without needing to send a drill to the body. If we can better constrain the ages of the Saturnian moons, then we should be able to have a better idea of how the whole system formed, which will improve our current models on solar system development. Figuring out what kind of objects hit these moons and what their contribution to the cratering record is a small piece of the puzzle that is understanding how the Saturn system came to be. I’m currently training for a 10k that I’ll be running with my officemate in November at Disneyland! An ideal day off for me would probably involve spending time at a theme park with some of my closest friends or going for a run and then sitting down with a good book. Please welcome Sierra to Real Scientists! Previous story Planetary Happy Snaps – Divya M Persaud joins Real Scientists for Cassini Week!